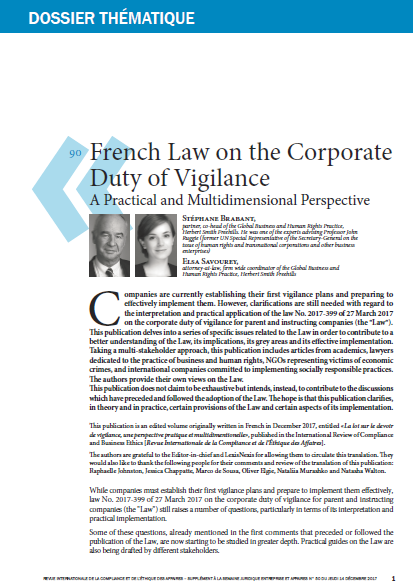 string(1239) "Resource Centre > Uncategorized > French Law on the Corporate Duty of Vigilance – A Practical and Multidimensional Perspective"
Companies are currently establishing their first vigilance plans and preparing to effectively implement them. However, clarifications are still needed with regard to the interpretation and practical application of the law No. 2017-399 of 27 March 2017 on the corporate duty of vigilance for parent and instructing companies (the “Law”). This publication delves into a series of specific issues related to the Law in order to contribute to a better understanding of the Law, its implications, its grey areas and its effective implementation. Taking a multi-stakeholder approach, this publication includes articles from academics, lawyers dedicated to the practice of business and human rights, NGOs representing victims of economic crimes, and international companies committed to implementing socially responsible practices. The authors provide their own views on the Law. This publication does not claim to be exhaustive but intends, instead, to contribute to the discussions which have preceded and followed the adoption of the Law. The hope is that this publication clarifies, in theory and in practice, certain provisions of the Law and certain aspects of its implementation.